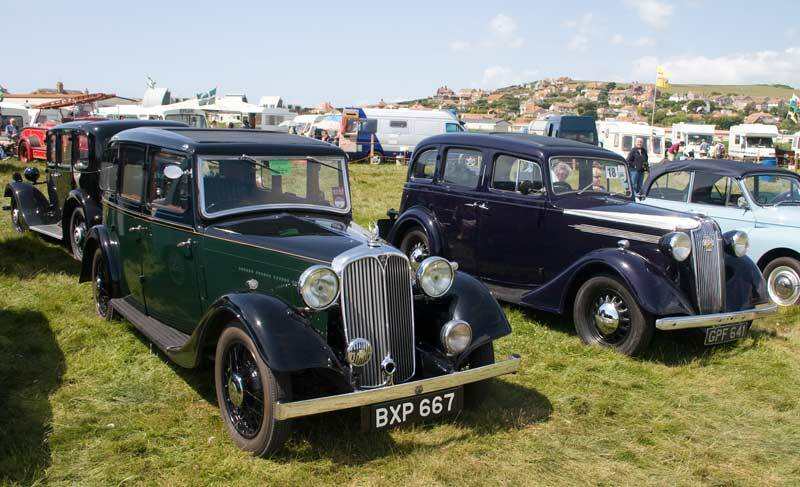 This page has photos of the Vintage Rally held at West Bay, Dorset on Sat. 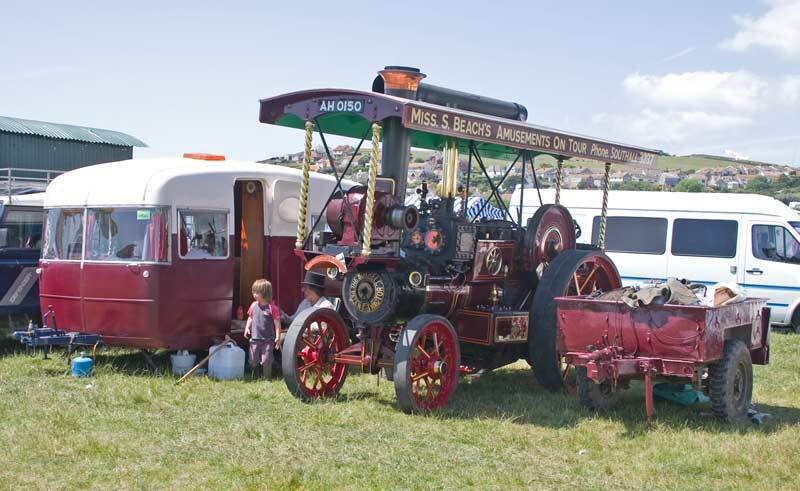 13 and Sun. 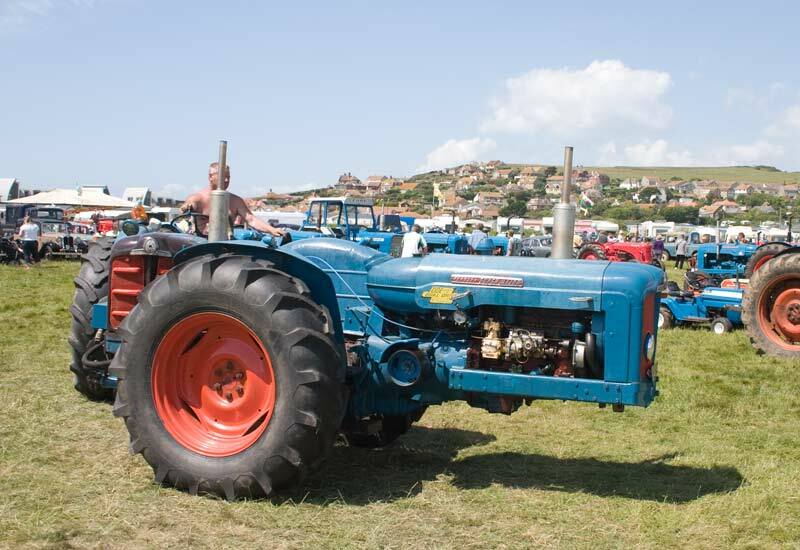 14 June 2009 - see WEST DORSET VINTAGE TRACTOR for more details. 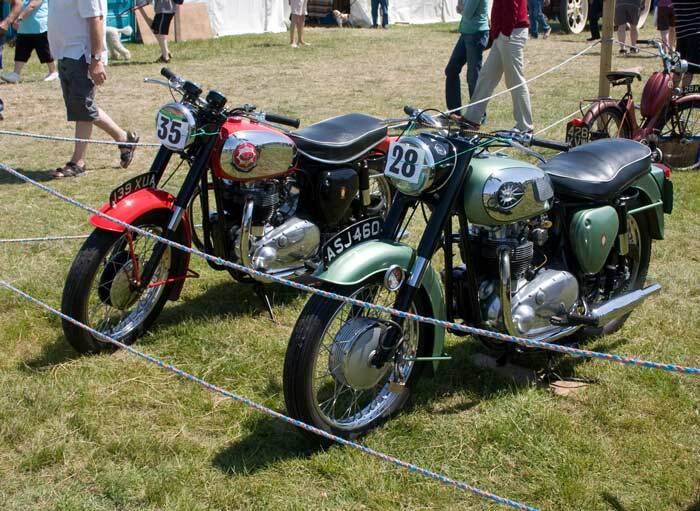 Only this one photo of motor bikes - a pair of BSAs, fine machines. 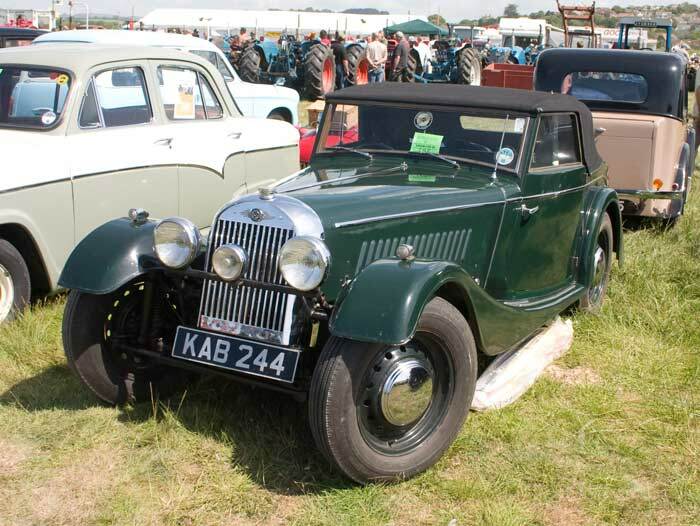 To start the cars, a Riley 1.5 litre, I had a Dinky Toy one as a child and always look out for them even now. 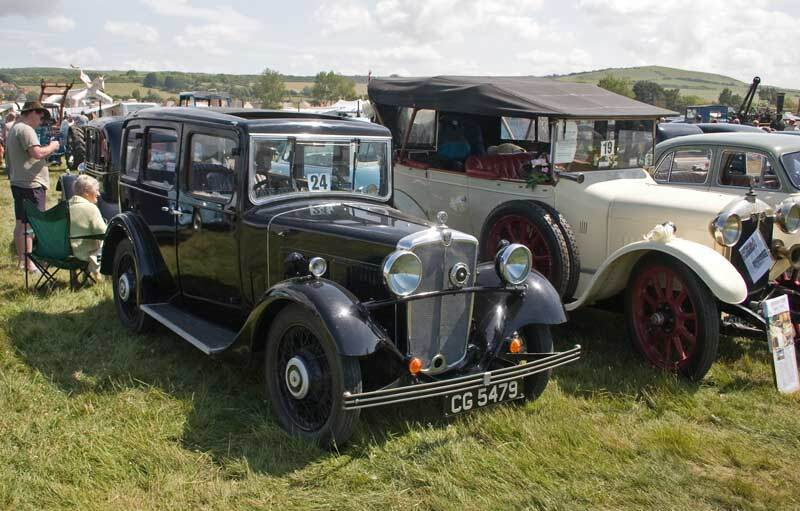 Next to the Riley, a Morris Eight in superb condition. 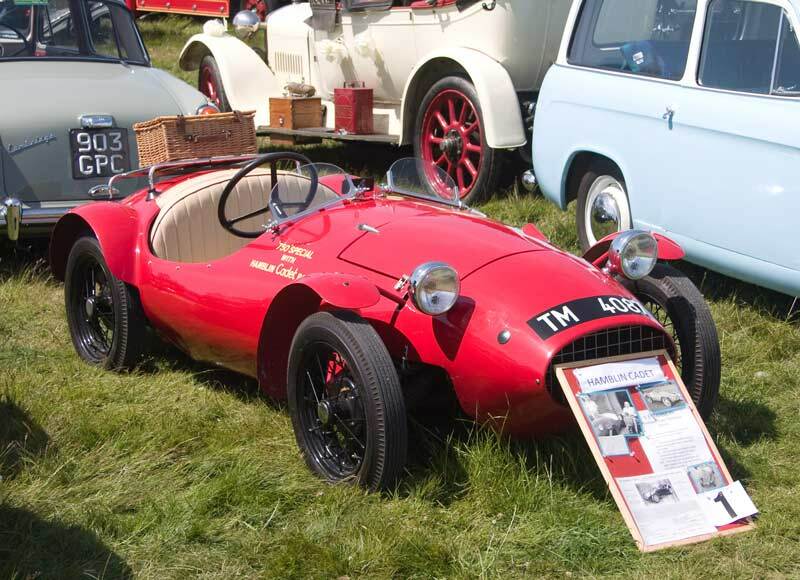 A Morgan, a design little changed for many years. 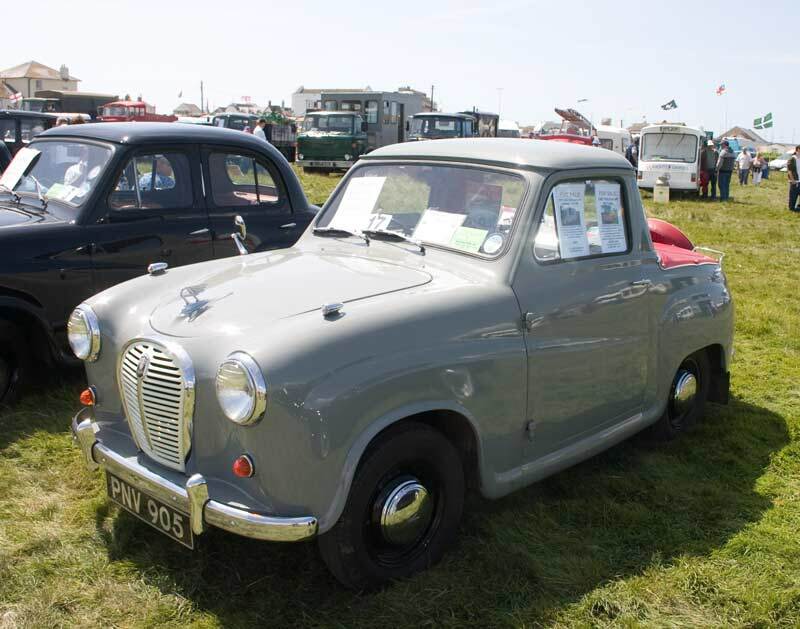 Next to that an Austin A55 Cambridge, good solid cars in their day. 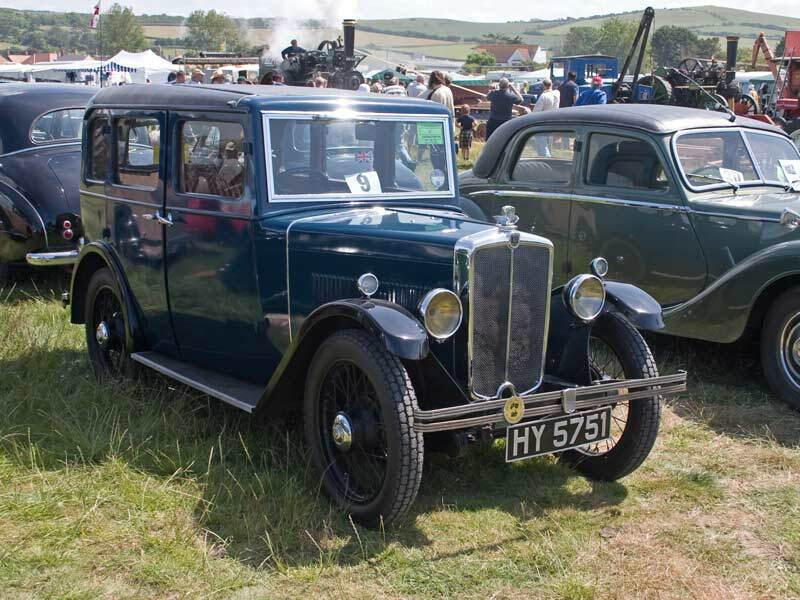 Two photos of a Morris Eight alongside a very impressive old Rover. 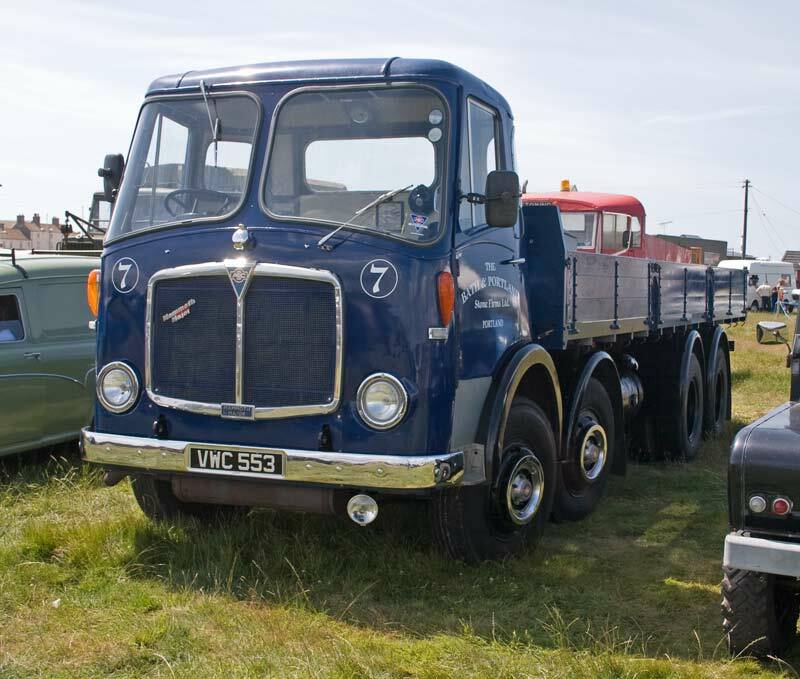 A Ford Thames 5 or 7 cwt. 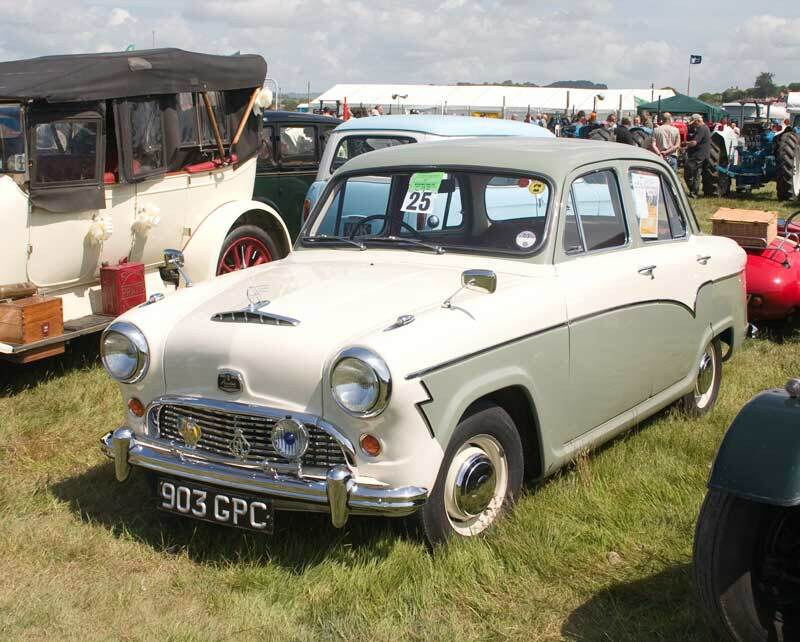 van converted to an estate car, once a popular conversion as vans didn't attract purchase tax unlike cars. 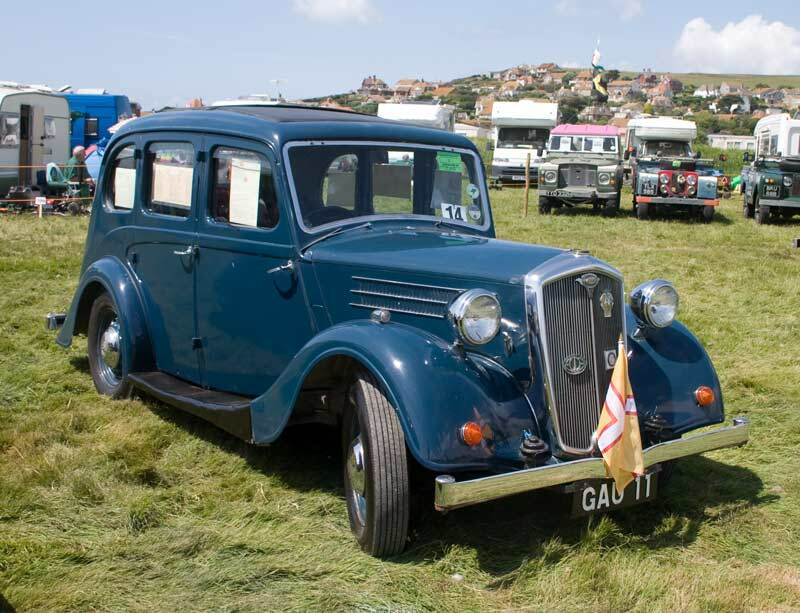 Next to it is Austin's answer to the Land Rover - an Austin Gypsy. 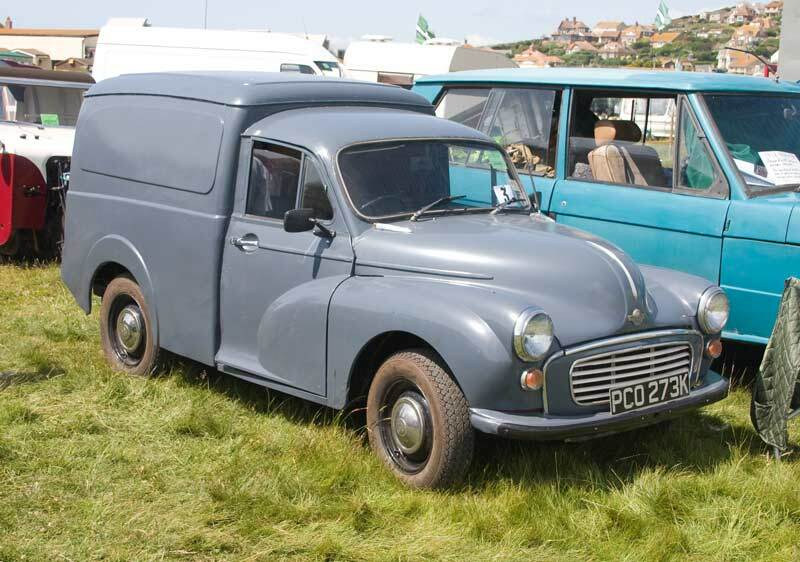 A Morris Minor van, no frills transport for tradesmen. 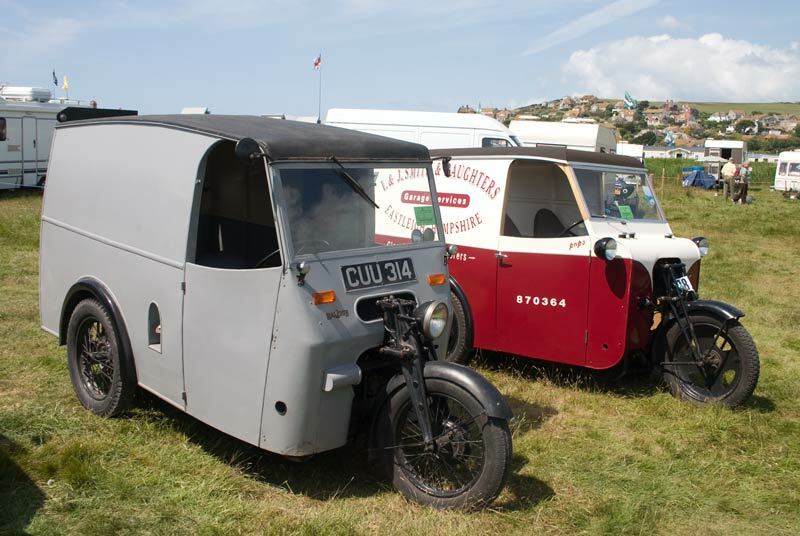 Staying with vans we have these two three wheelers, nearest the camera a Raleigh and next to it a James. 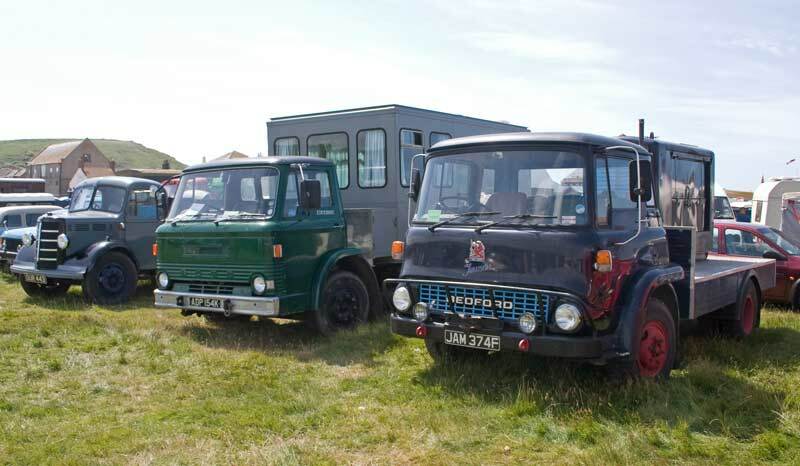 Both are a strange cross between ordinary van and motor bike. 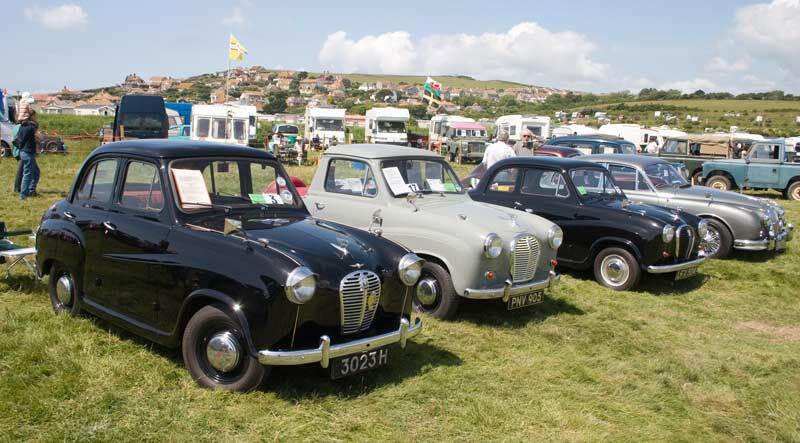 A pair of black Austins, nearest the camera is, I think, an A40 Somerset while beside it is an A30/A35. 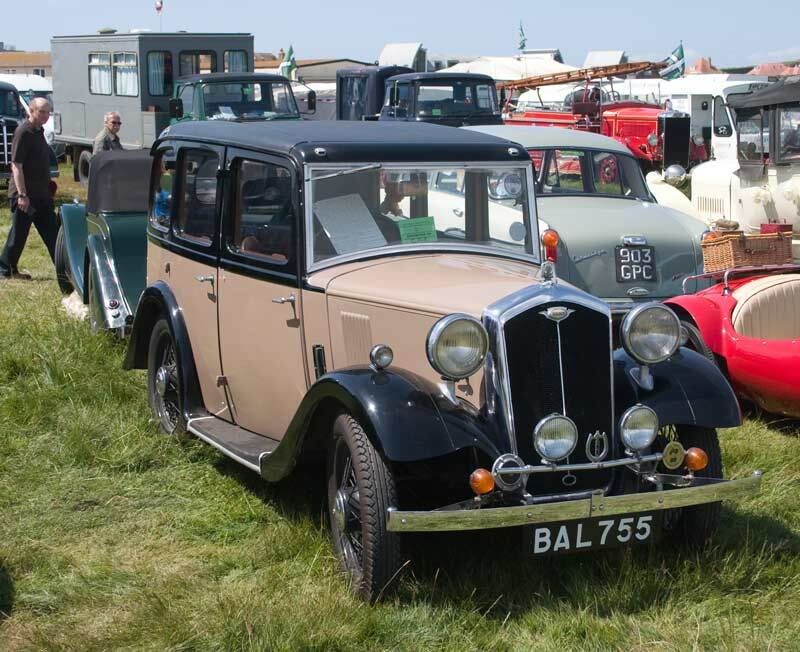 Next along was this Wolseley from the days before they were badge engineered versions of Morris cars. 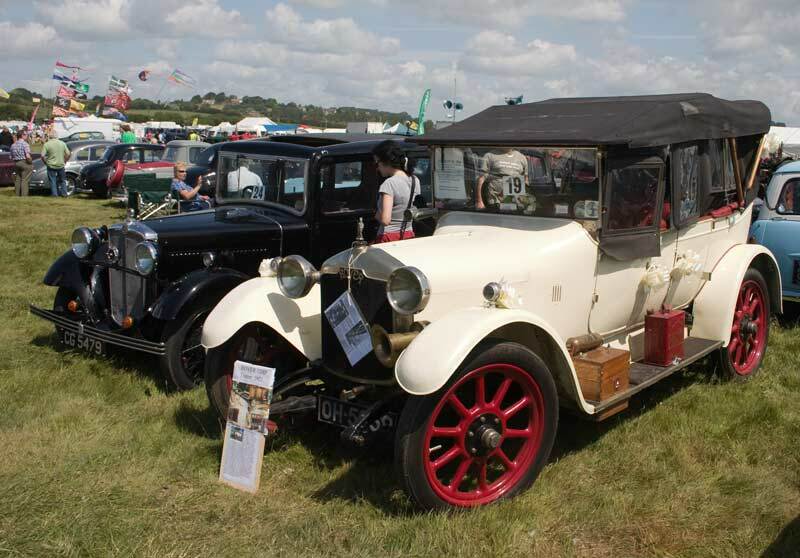 A Dorset marque at a Dorset show - the Hamblin Cadet was a kit car using an Austin 7 chassis produced in Sherborne. 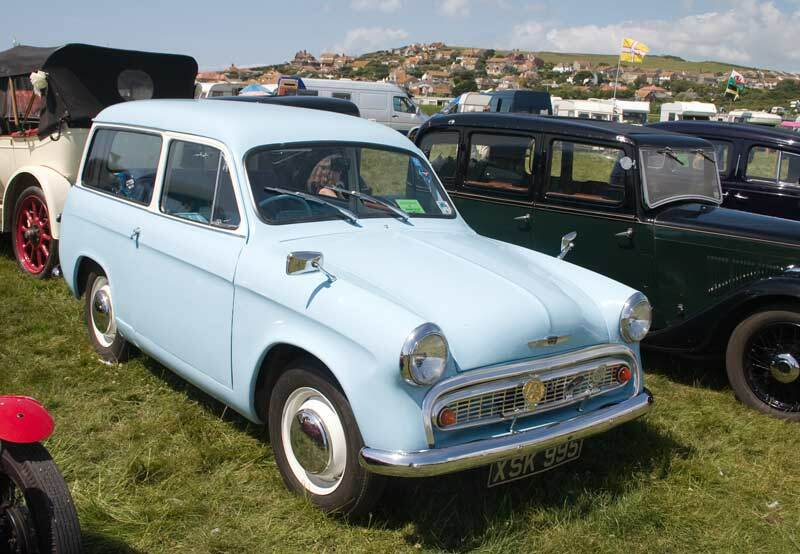 A Hillman Husky, based on the Minx it differed from the Minx Estate and was very similar to the Commer Cob van. 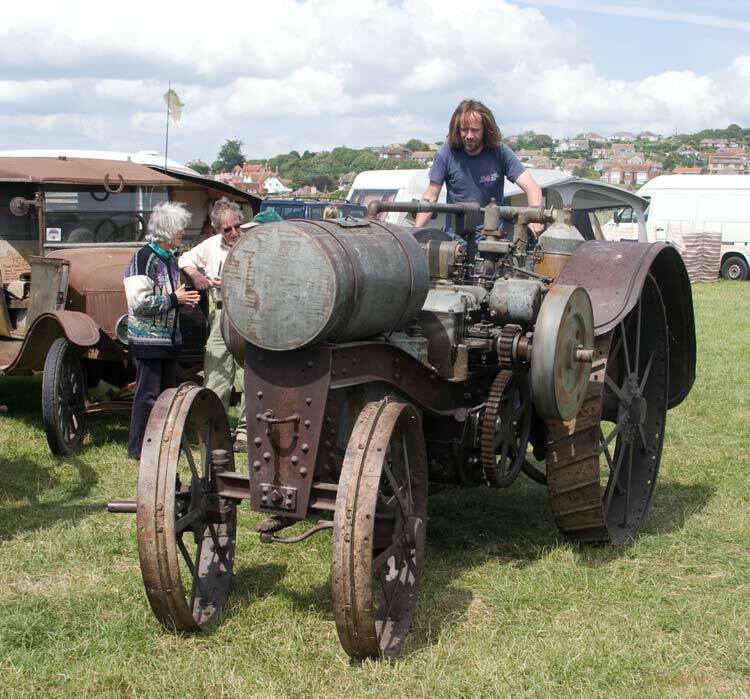 A Rover (I think) and right a Vauxhall. 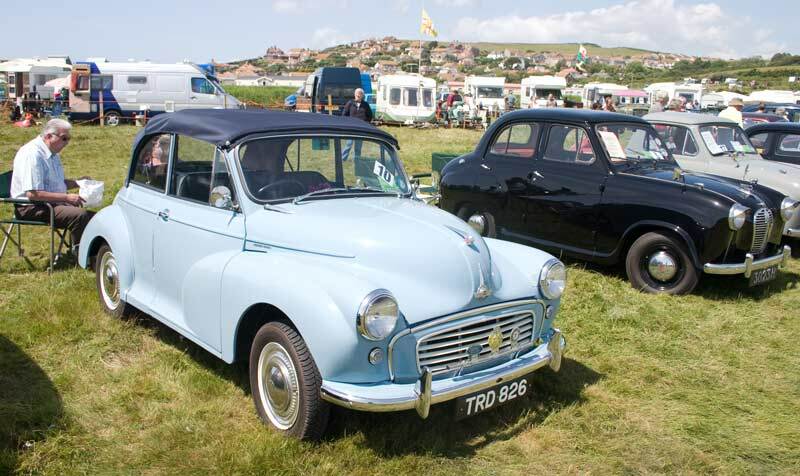 Another Morris Minor, this one's a convertible, a less common variant. 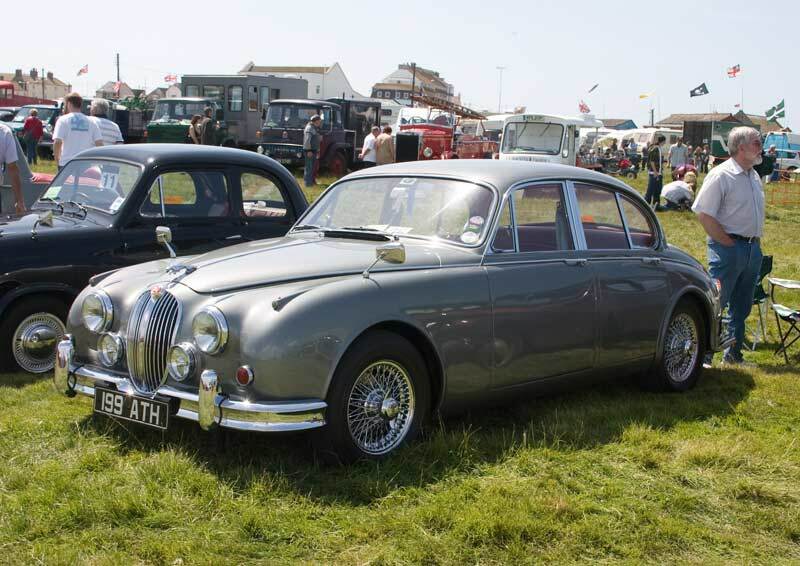 One of my all time favourites, a Mark 2 Jaguar, fantastic cars! 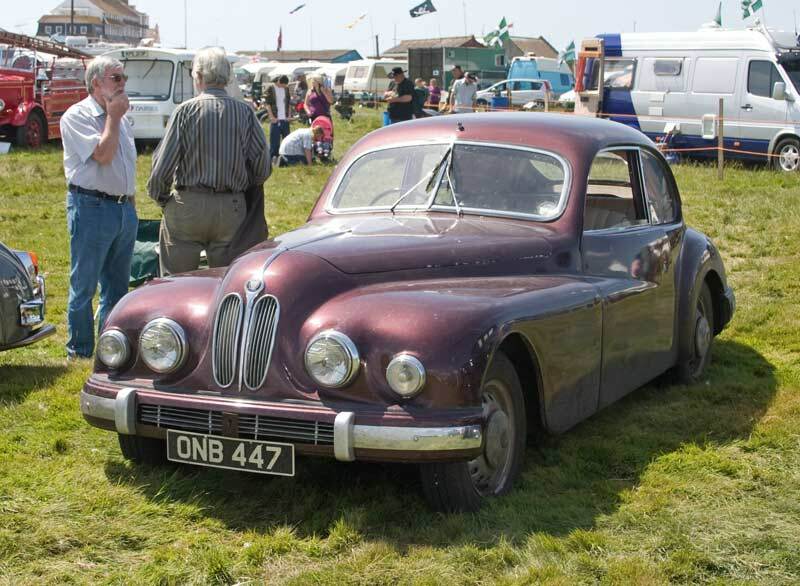 A rarer beast - a Bristol. 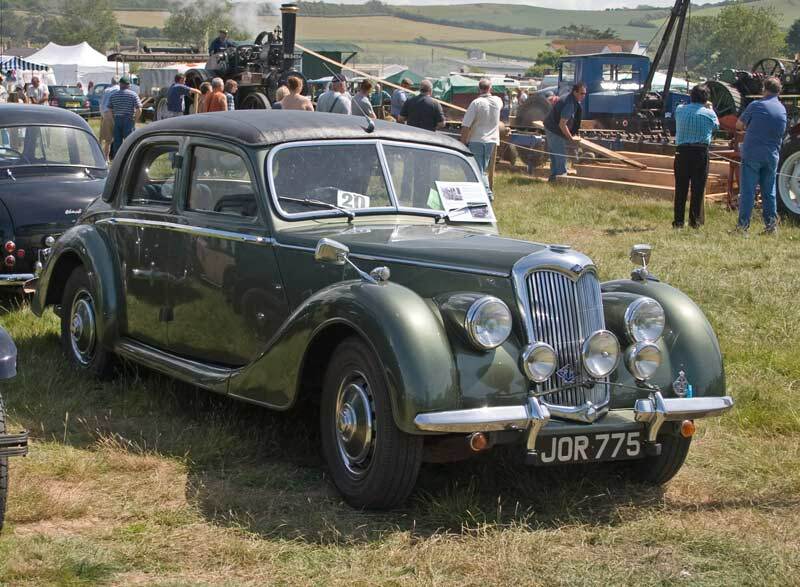 A Wolseley 12, proudly carrying the new Dorset flag. 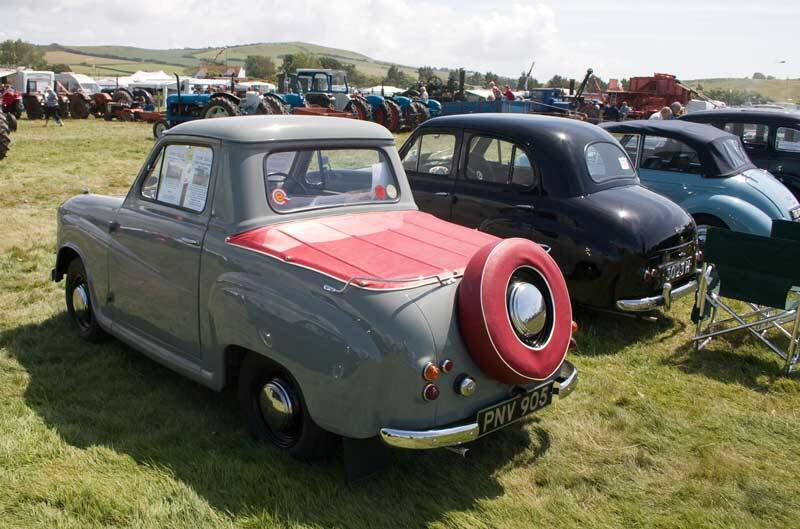 An Austin A30 left and two A35s including an unusual pick up version. 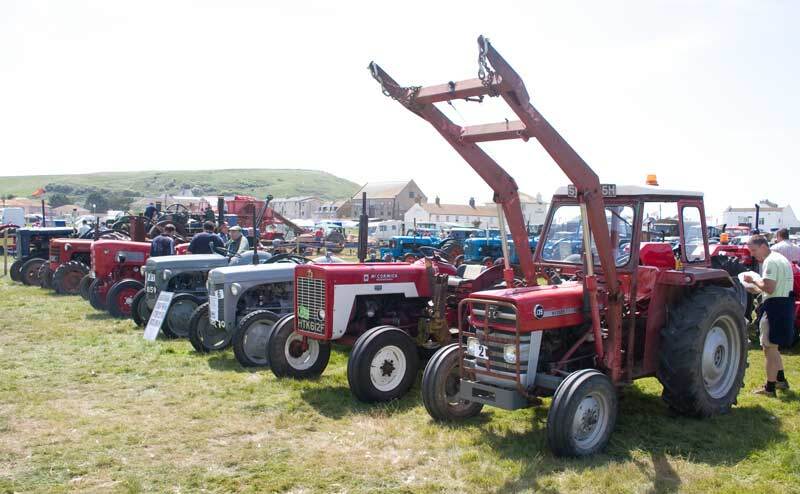 A closer look at the pick up - a rare variant, only 475 were produced. 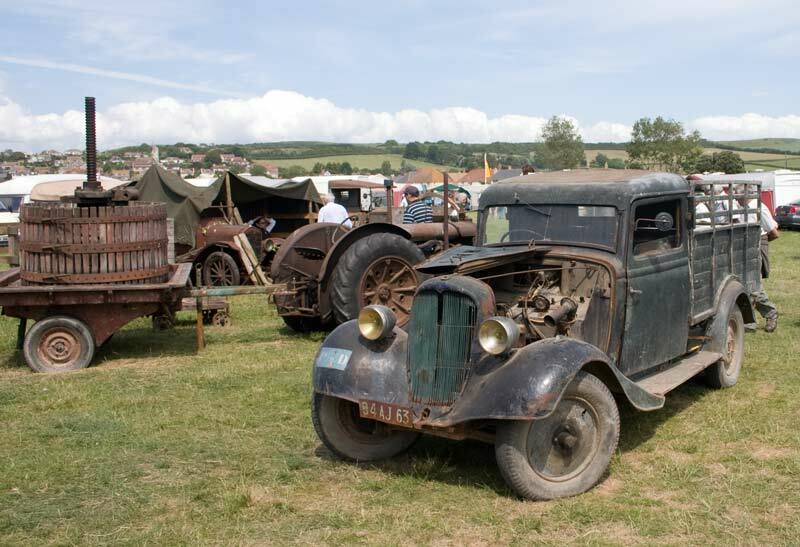 A 1930s American pick up in unrestored condition, I think this one is in regular use on the farm. 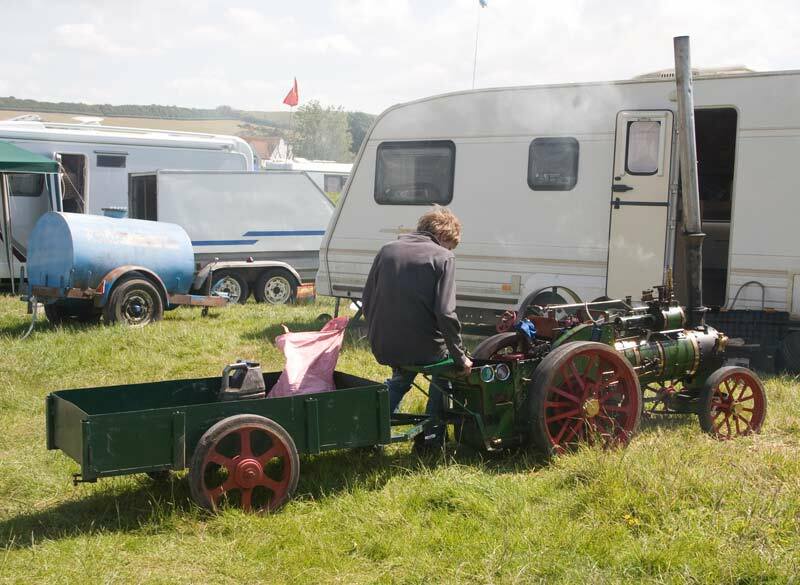 Shown by the same group of exhibitors was this decidedly elderly tractor that was running - it took a lot of effort heaving on the controls and left a strong smell of paraffin behind it as it literally chugged along. 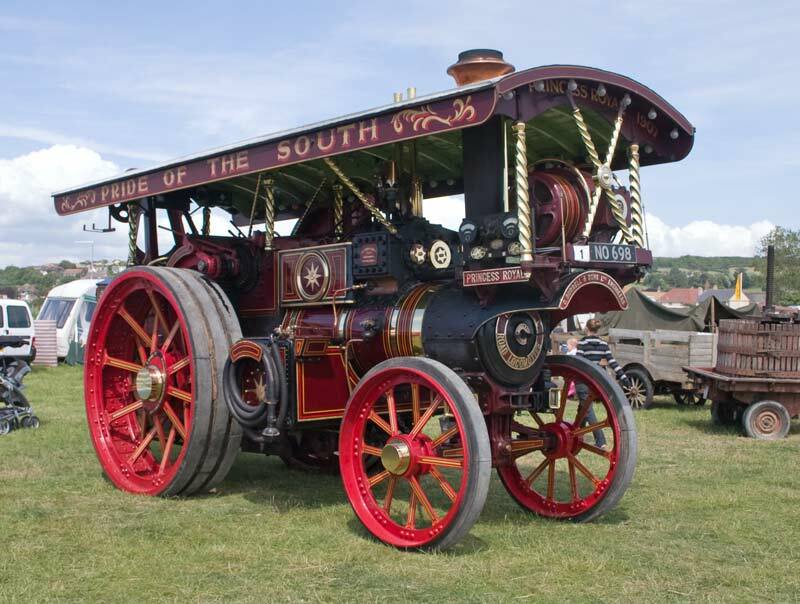 This extraordinary machine is two Fordsons joined together, it is steered by hydraulic rams and can turn through 90° and spin almost in its own length. 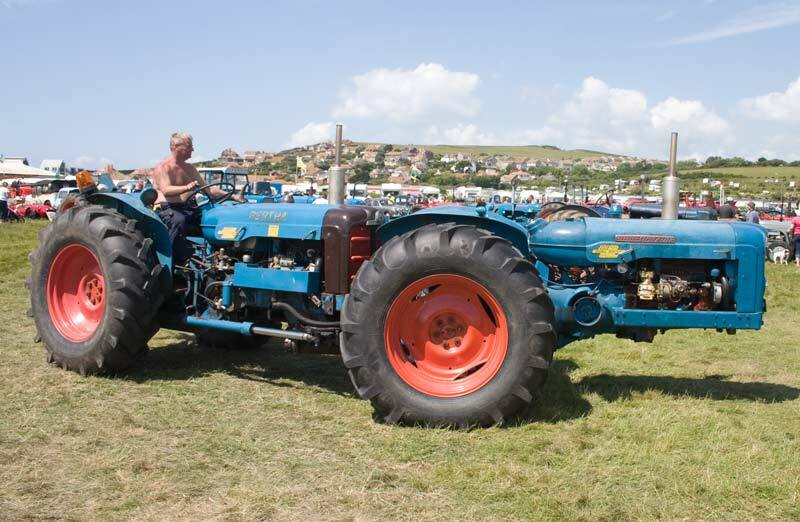 The idea was to make a 100bhp, 4 wheel drive tractor for heavy work. 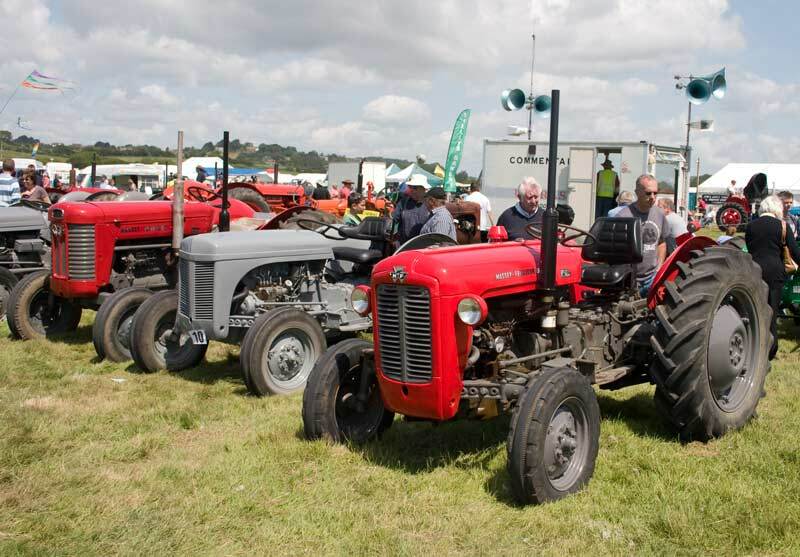 Two Massey Ferguson tractors flank a Ferguson TE20 - a Little Grey Fergie. 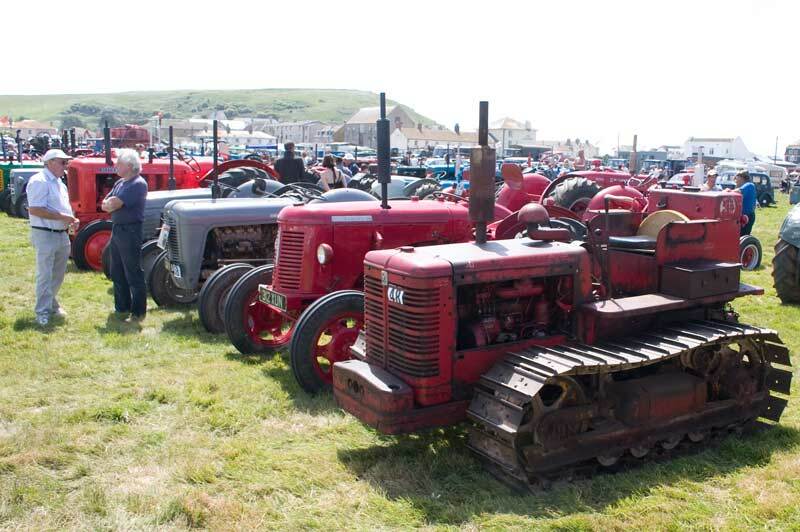 A varied line up of tractors including a crawler, a David Brown, two grey Fergies and a Nuffield. 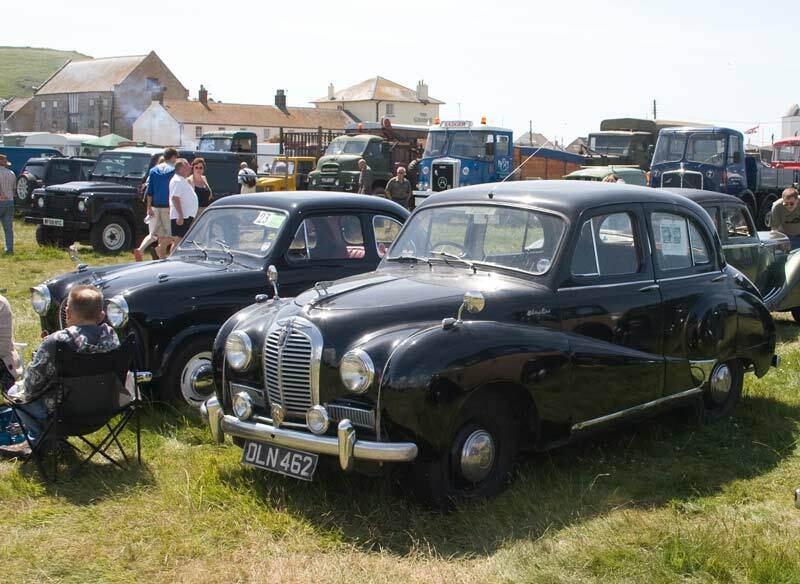 Two venerable Fordsons, one being in the green of wartime deliveries when bright colours might have attracted an attack from the skies. 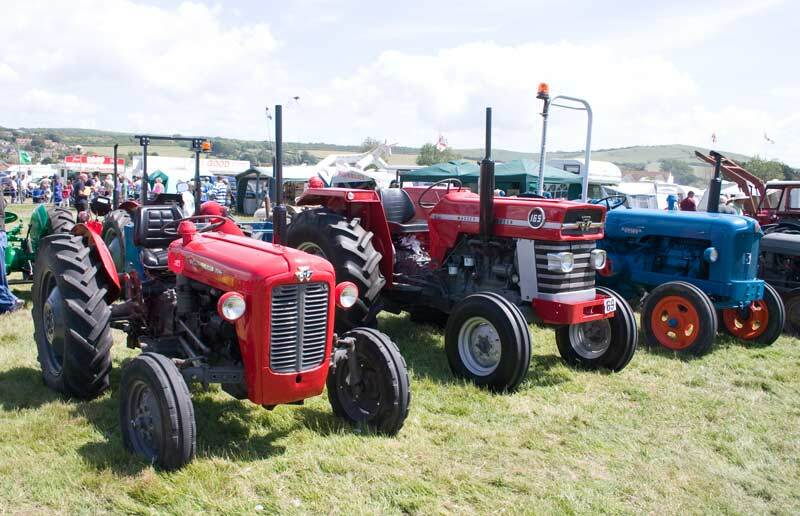 Another line up of tractors this time including a Massey Ferguson 135, a McCormick and two more "little grey Fergies". 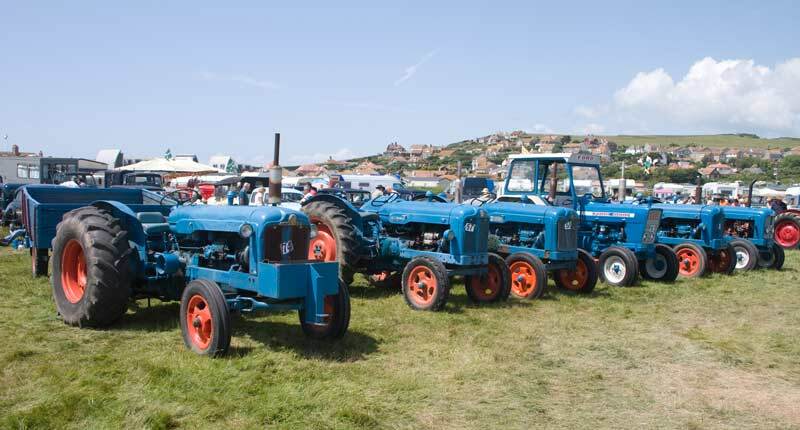 A line of Fordsons including one Ford as they were later known. 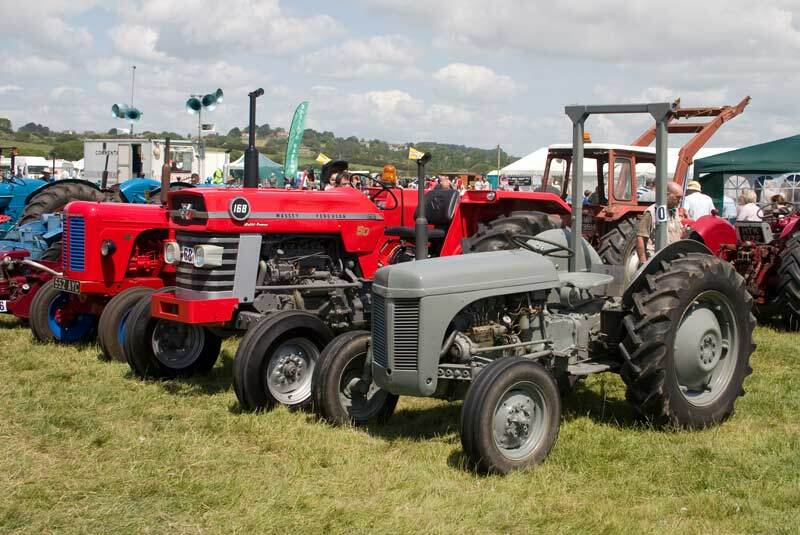 A grey Fergie and two Masseys - not sure about the authenticity of the blue wheels and grill on one of them but it's up to the owner what colour he paints it! 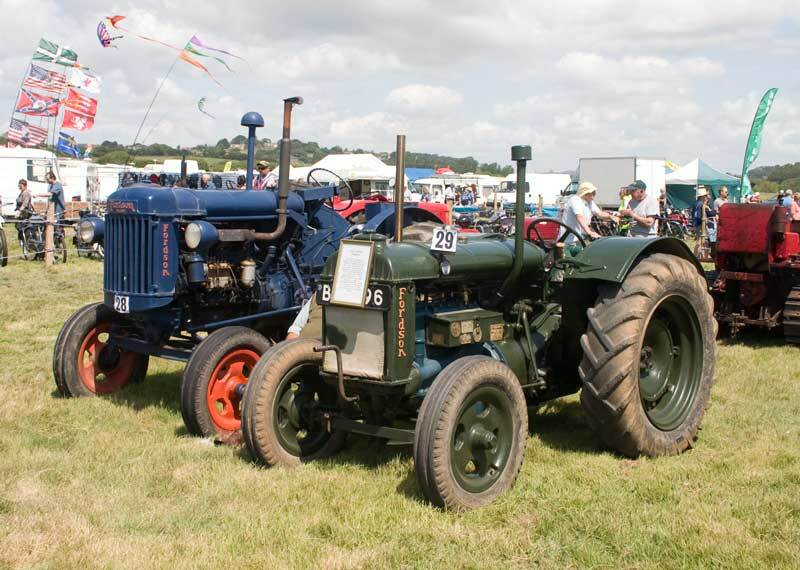 This time it's two Masseys and a Fordson. 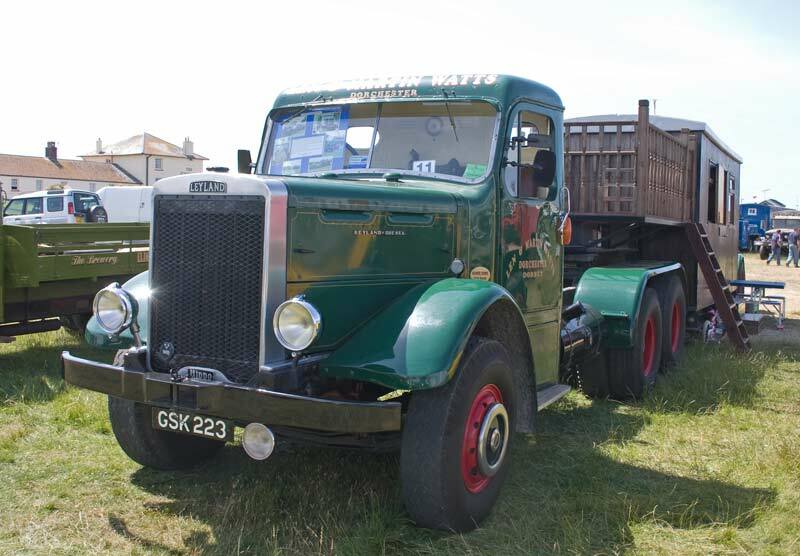 A rarer tractor - an Oliver from the USA. 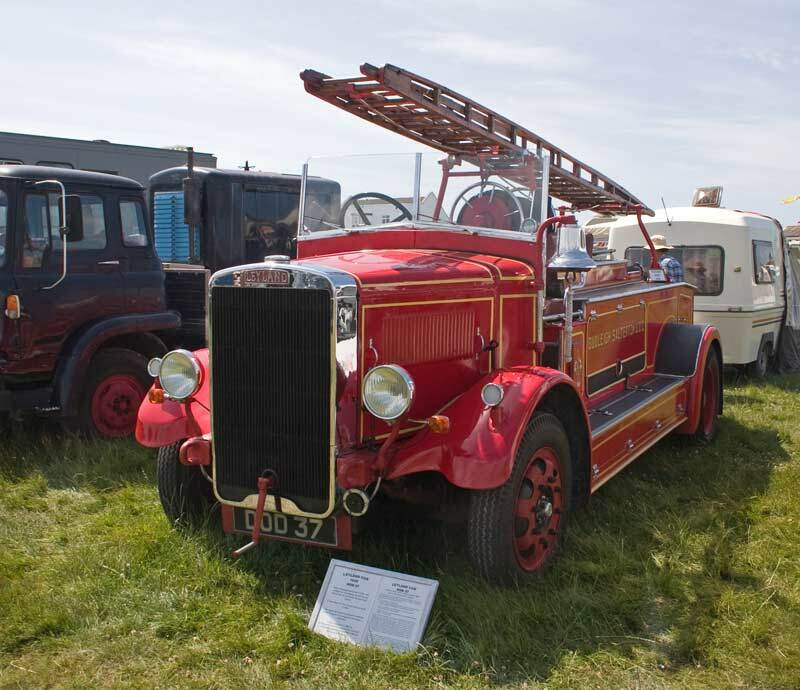 A 1939 Leyland Cub fire engine originally with Budleigh Salterton UDC brigade. 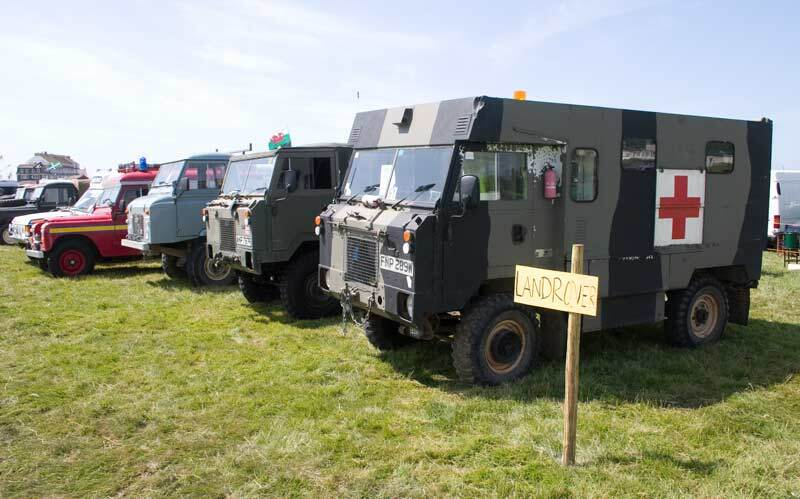 Now to Land Rovers starting with some forward control examples, two ex military and a civilian one. 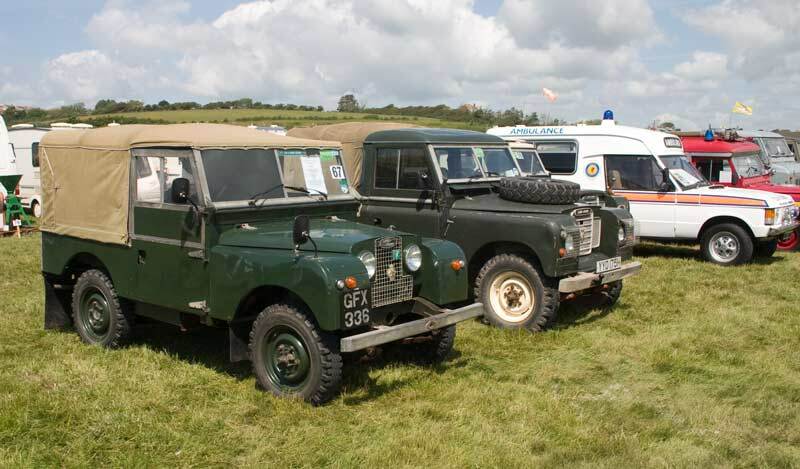 A Land Rover line up including forward control ones, a fire engine and a Range Rover ambulance. 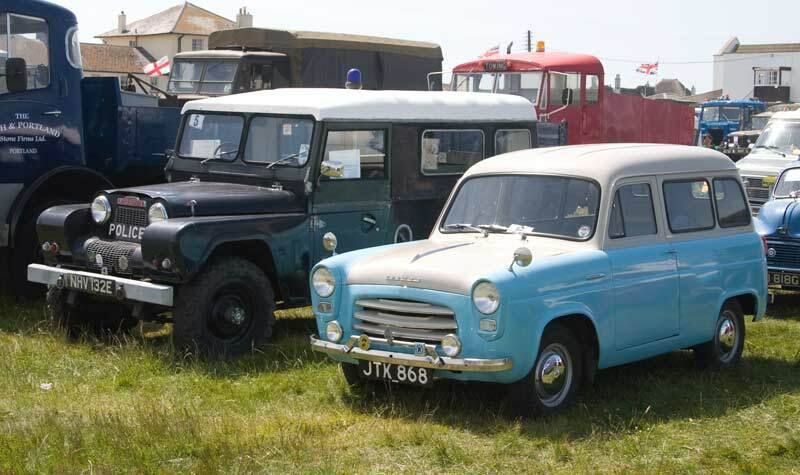 Another varied Land Rover line up. 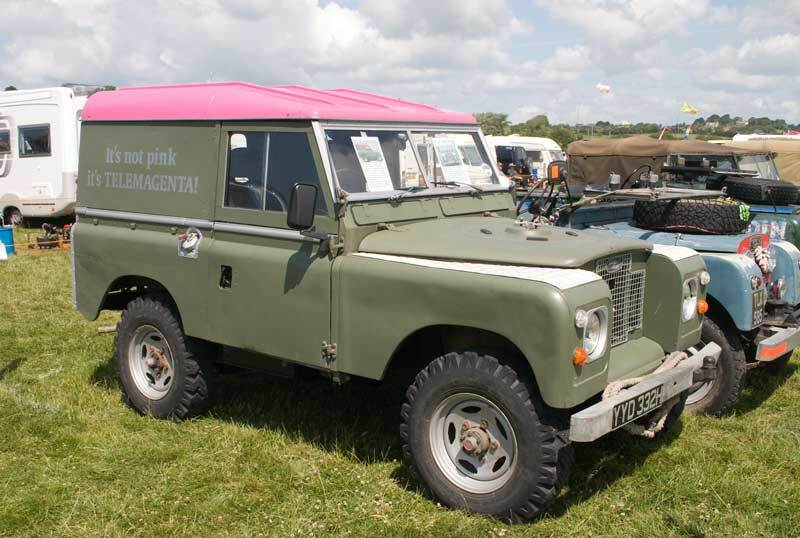 It's not pink, it's telemagenta! Well, that's what it says on the side! 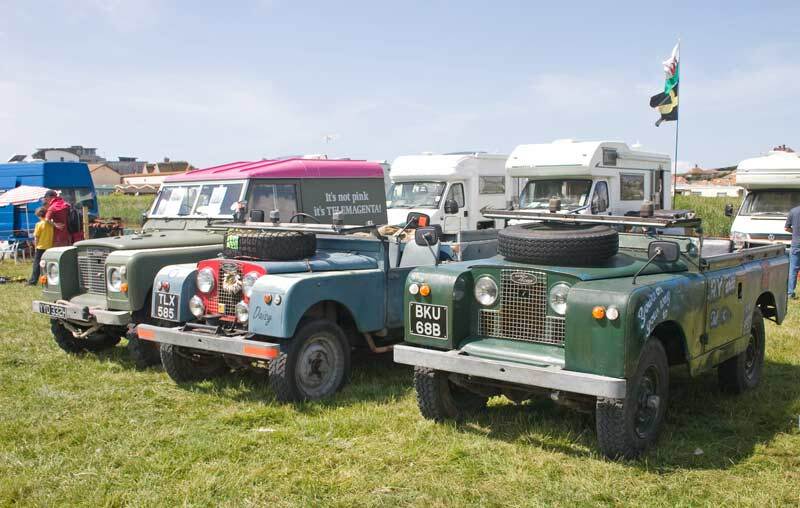 A pair of Land Rovers with their tops off and screens down - great on a hot day! 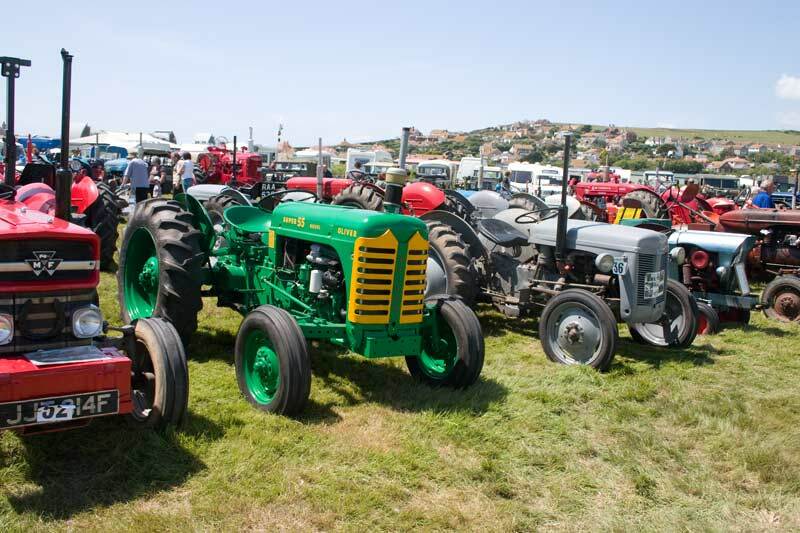 Another pair, these have their tops on. 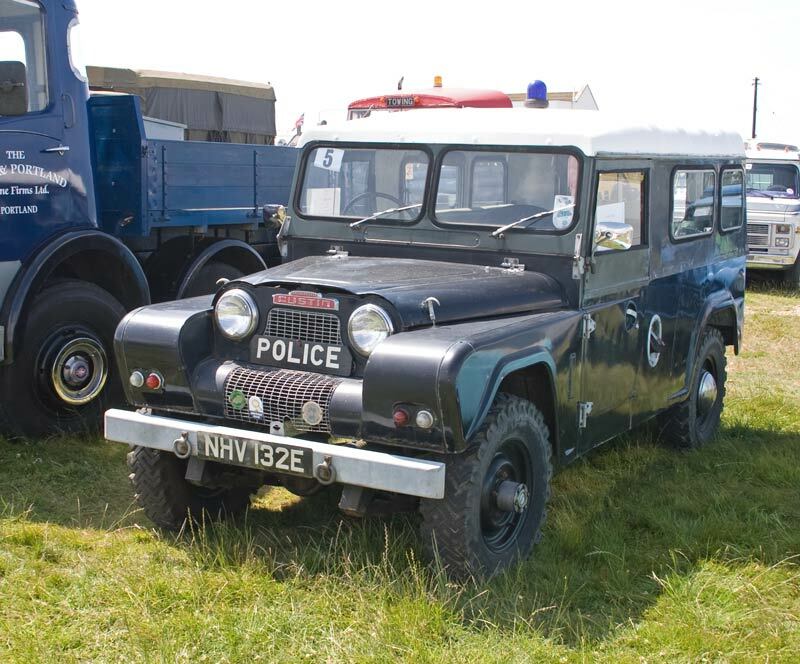 Not a Land Rover but an Austin Gypsy, this one is in Police colours. 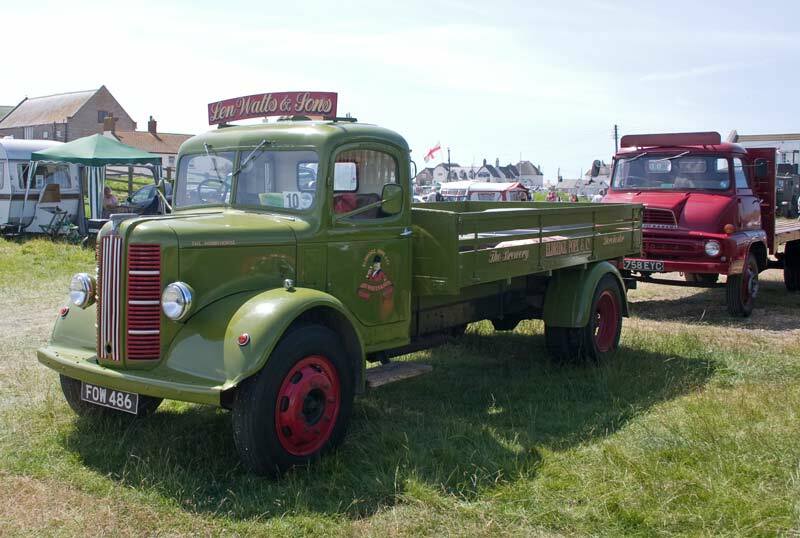 On to the lorries with a Bedford TK left and a Ford D Series. 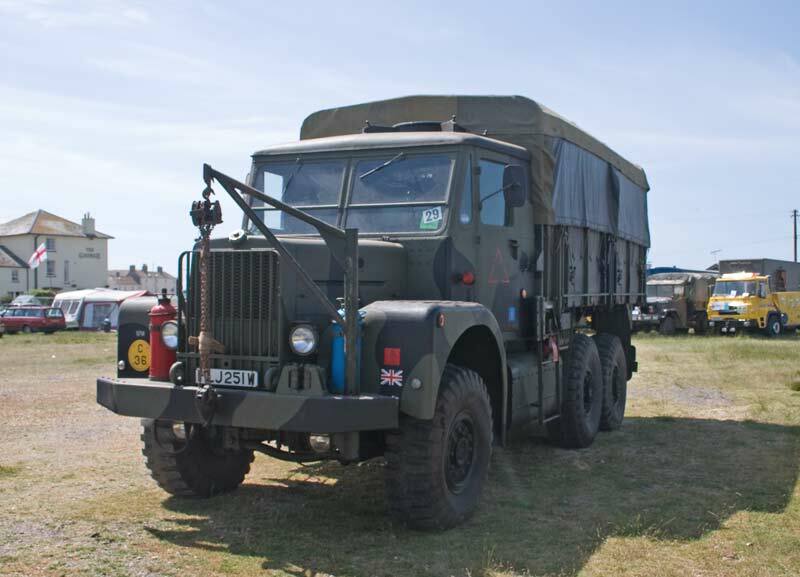 A bit bigger, a AEC Mammoth Major 8 wheeler, not something you see now with artics dominating. 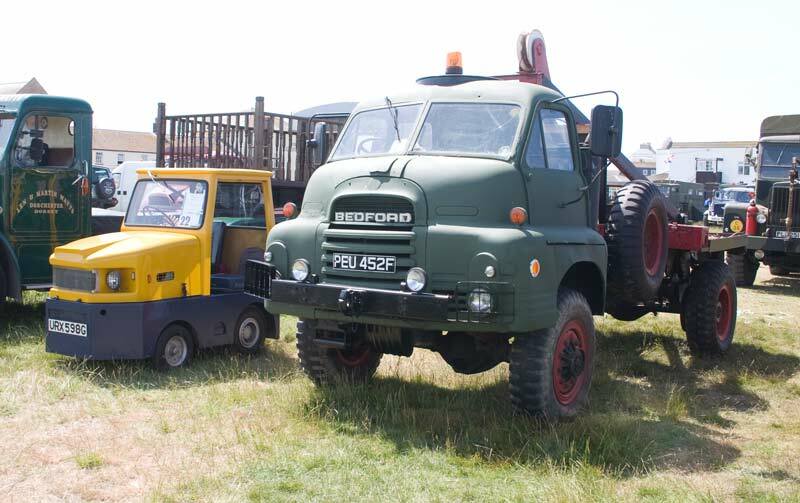 A military style 4 wheel drive Bedford beside a little factory tug. 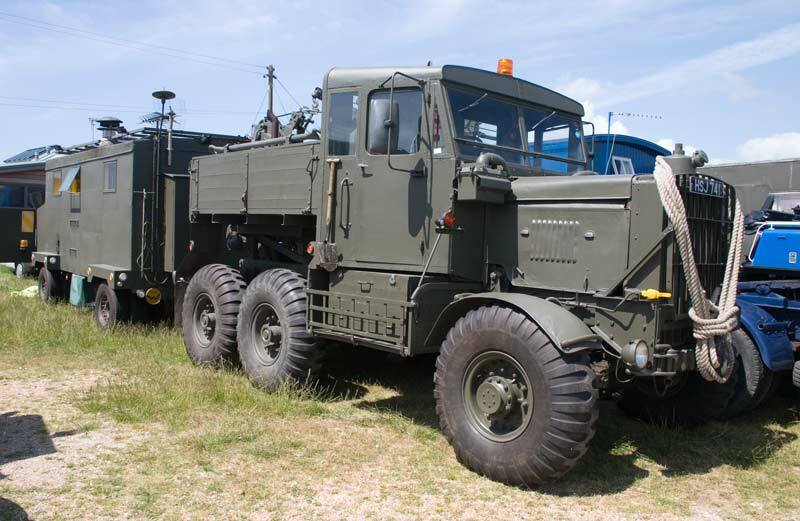 A heavy haulage Scammell, this one is named "Sir Robert". 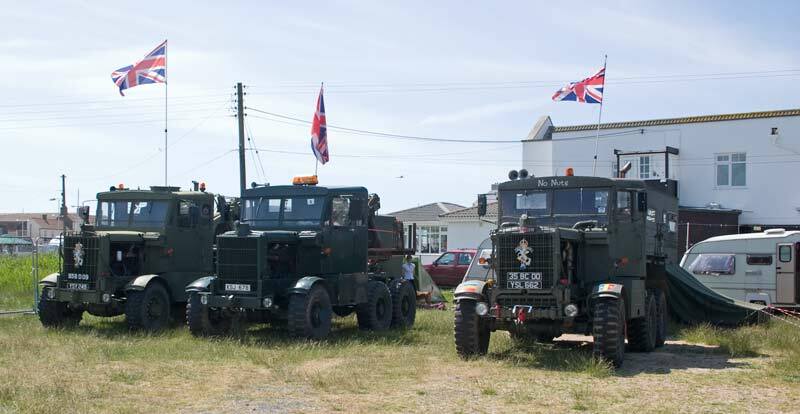 Various military Scammells were exhibited in this part of the show. 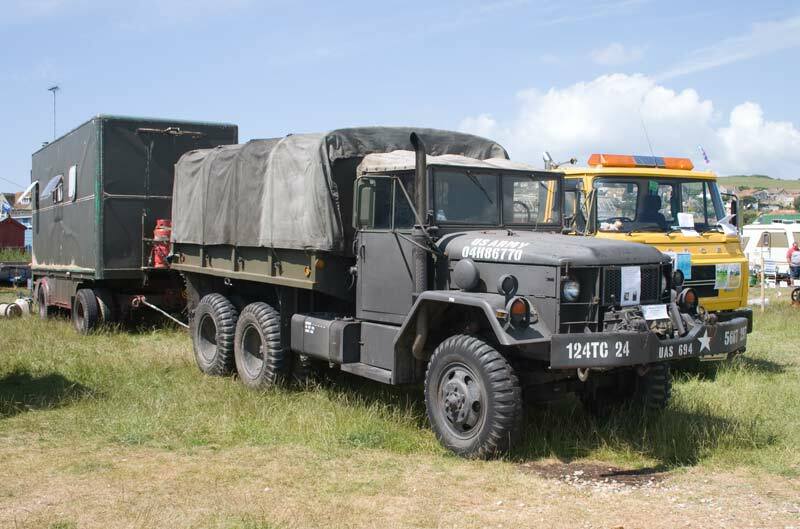 The US Army equivalent of the Scammells. 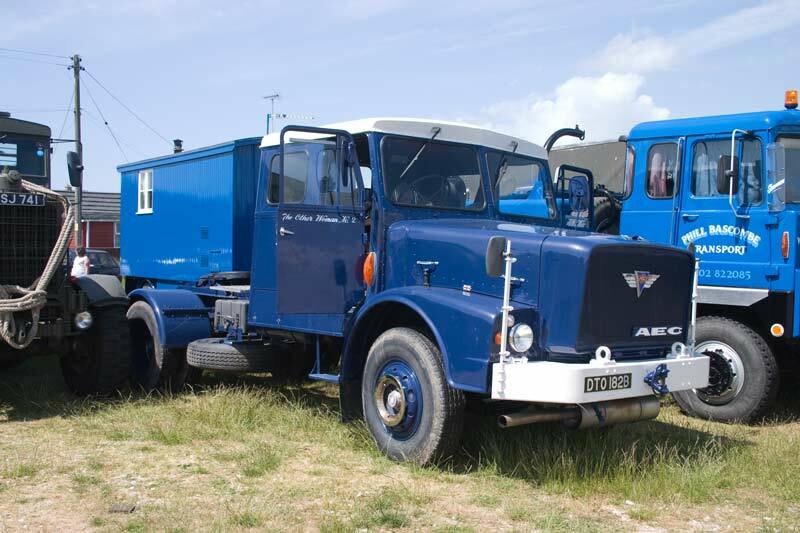 An Austin brewers dray in the colours of Eldridge Pope Brewery. 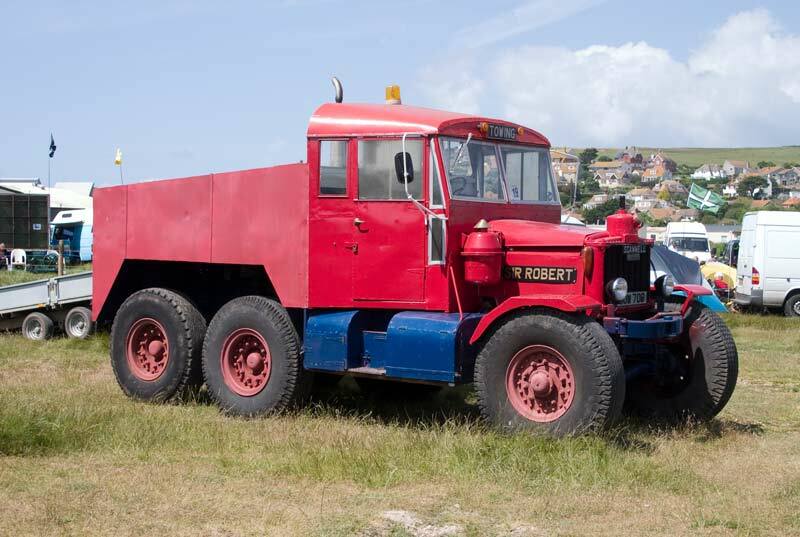 A Leyland Hippo with an interesting living unit on the semi-trailer. 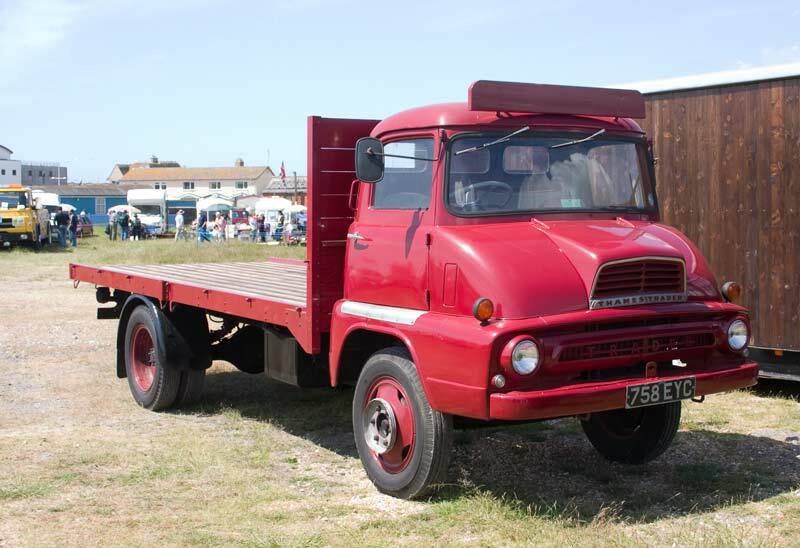 A Thames Trader - never did work out why Ford called their vans and lorries Thames rather than Ford. 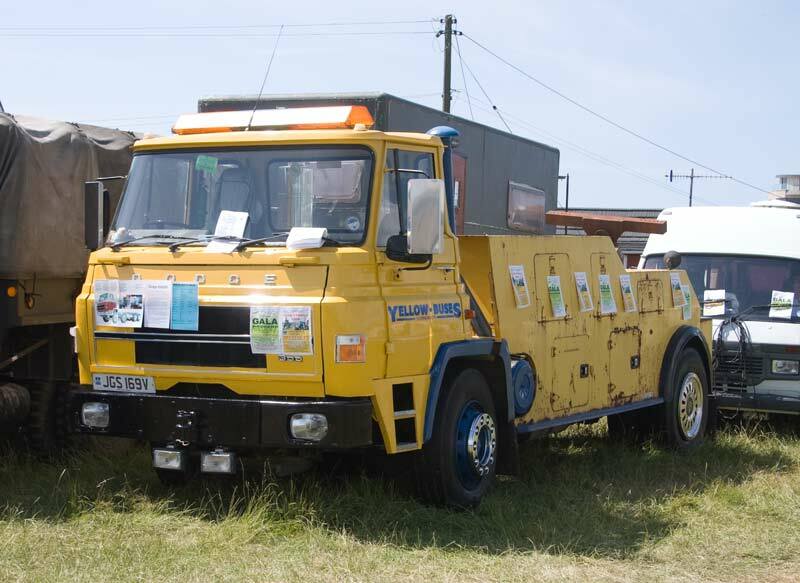 A Dodge recovery truck in the colours of Bournemouth's Yellow Buses. 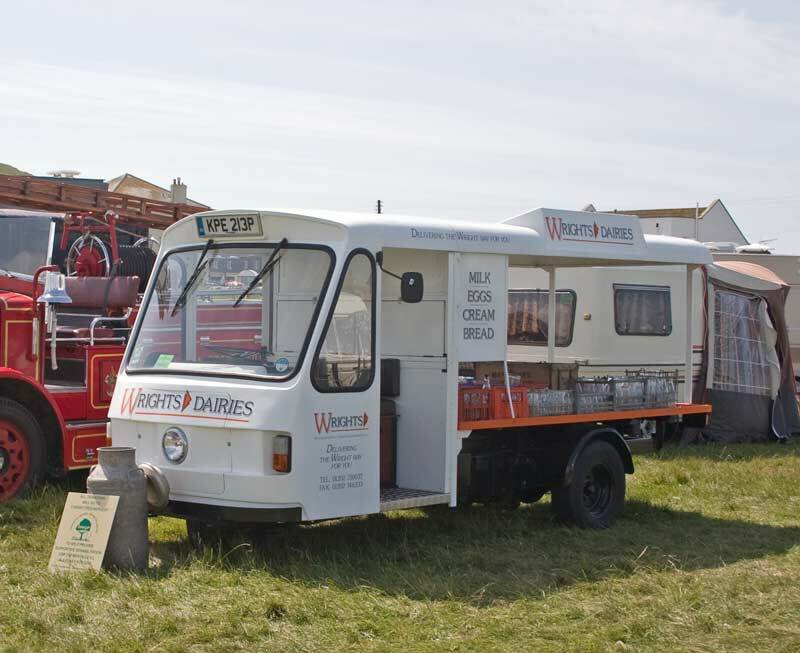 An AEC artic - on the door it says "The Other Woman No 2"
Once a common sight in towns, an electric milk float. 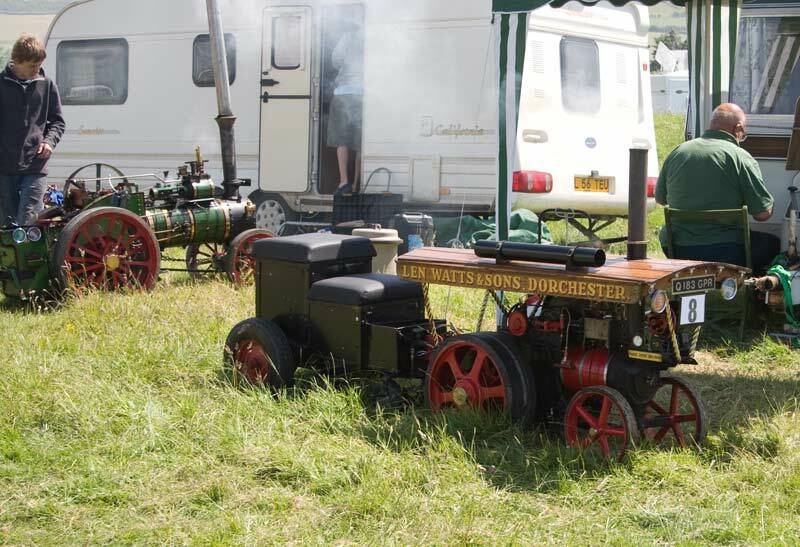 There were several miniature traction engines in the Rally, this is a selection of them. 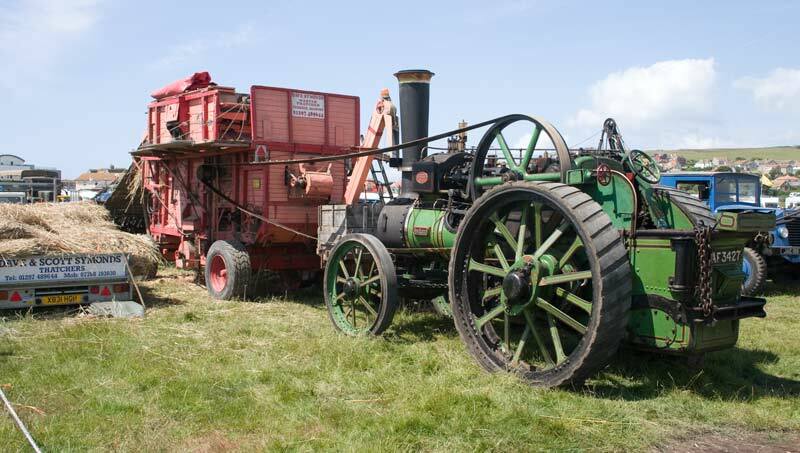 A traction engine driving a threshing machine, still useful as the straw from crops cut and threshed the traditional way is suitable for thatching whereas that from a combine isn't. 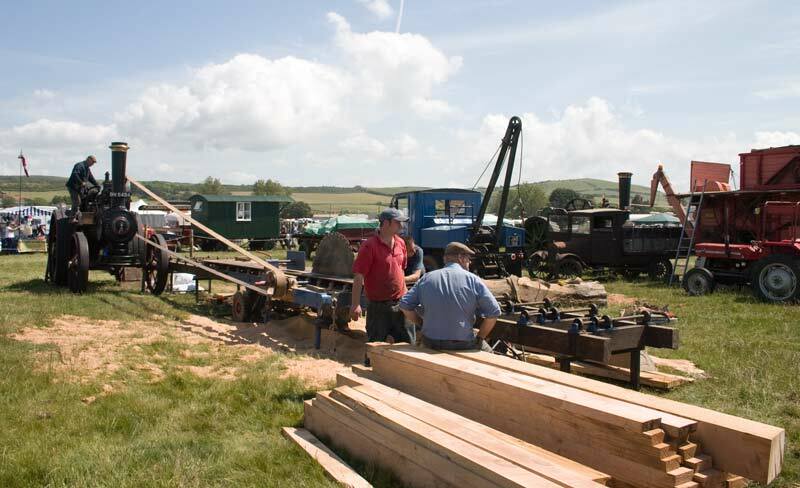 More working steam, a traction engine powering a saw bench. 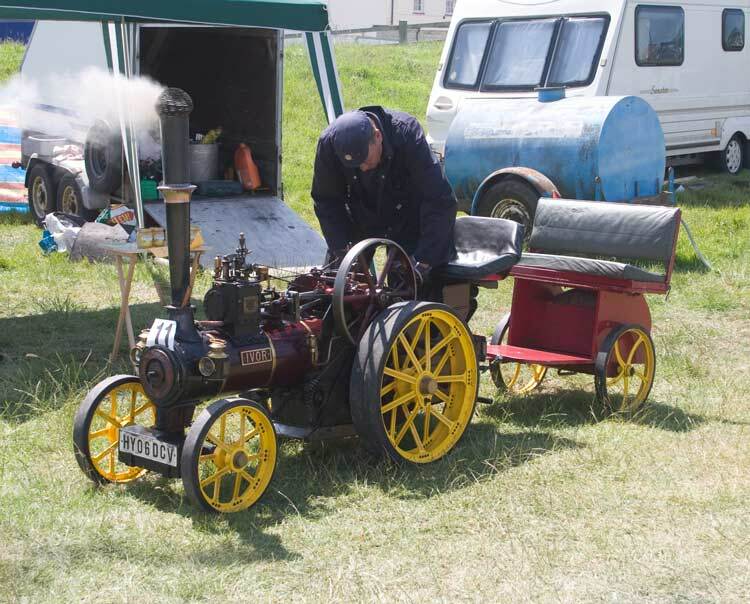 Also present was this Burrell showman's engine. 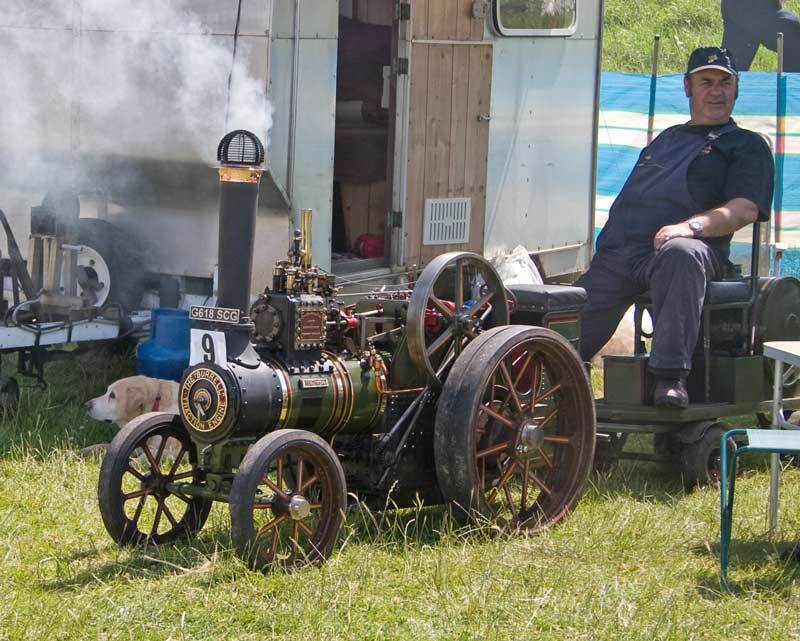 There was another Burrell showman's engine present, both of them made a fine sight.